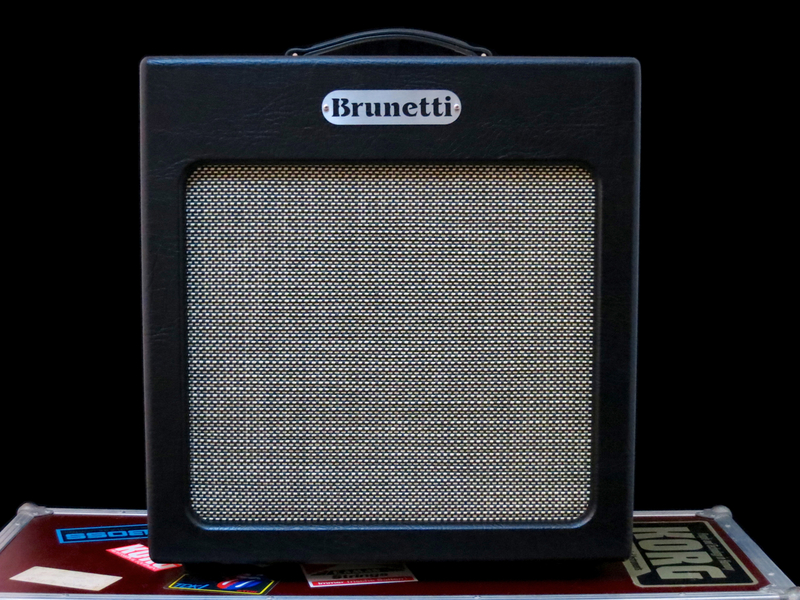 Brunetti Amplification is an amp maker from the town of Modena in northern Italy. 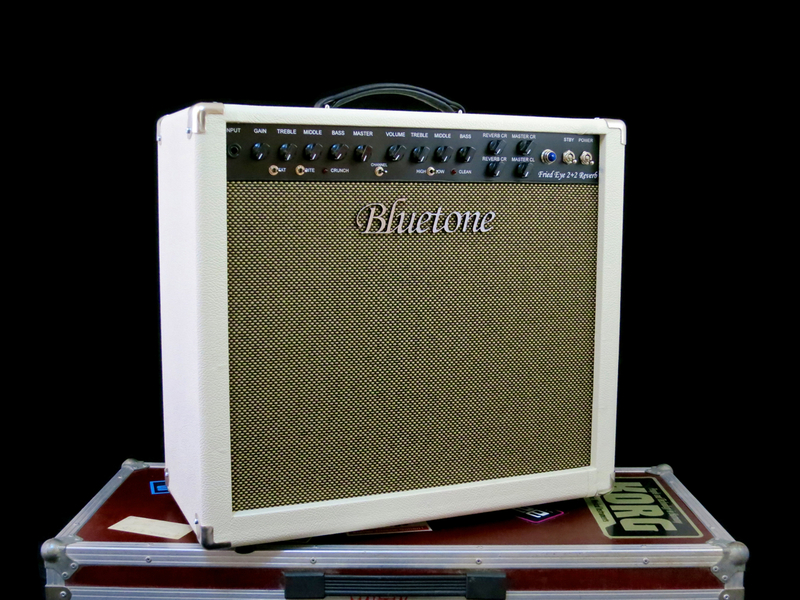 Marco Brunetti’s team handcrafts a number of tasty and stylish guitar amps and effect pedals. 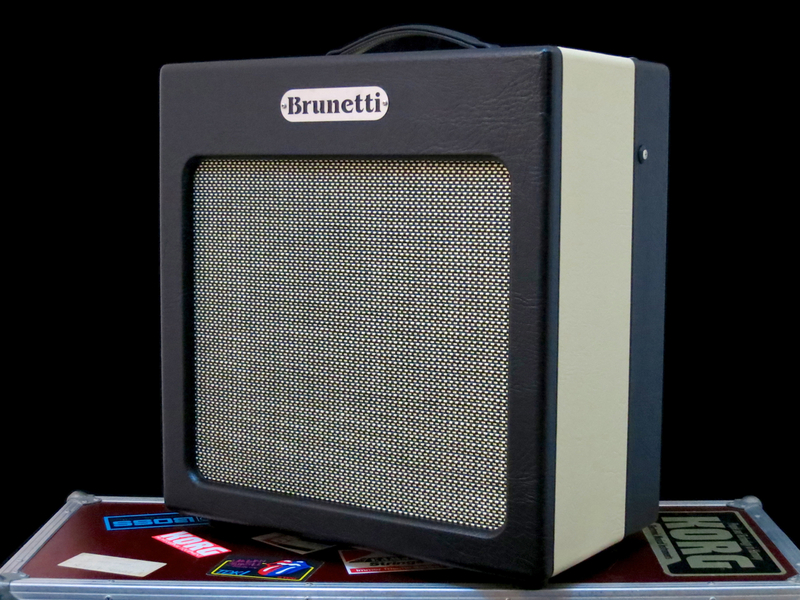 In addition to custom orders Brunetti also manufactures a range of standard models, of which the SingleMan 16 is the smallest combo amp. Brunetti-products are distributed in Finland by NordSound. The main aim behind the Brunetti SingleMan 16 (1,348 €) is to come up with a compact, single-channel design that nevertheless offers a maximum of tonal flexibility for the working musician. The elegant two-tone finish and the combo’s clear lines make the SingleMan a real looker. The combo weighs in at a moderate 20 kilos. Its open-backed cabinet is made of high-quality plywood. 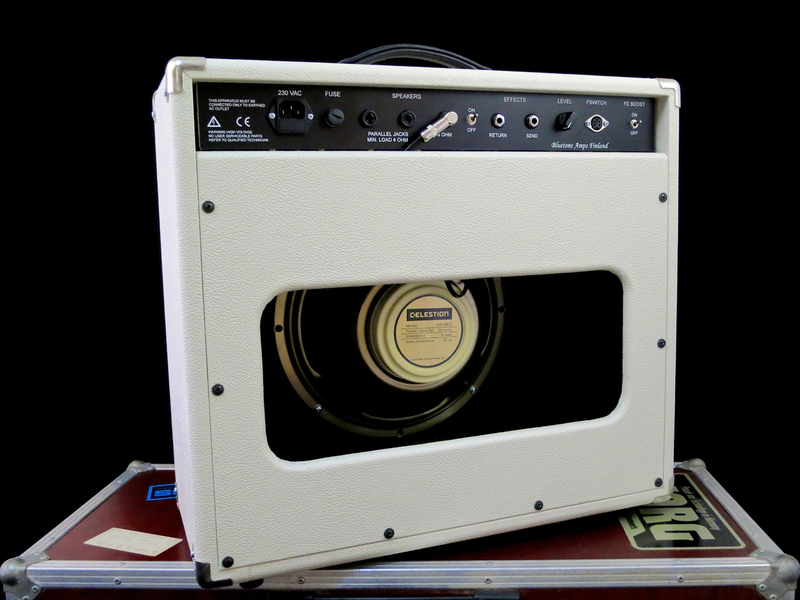 The Brunetti comes loaded with Celestion’s famous 12-inch Vintage 30, which is known for its precise and multifaceted sound. 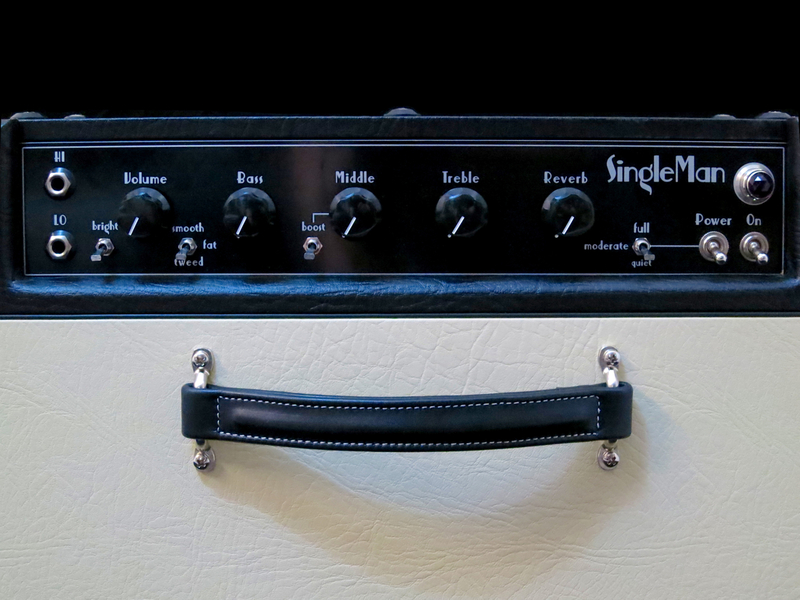 The SingleMan 16 is a genuine Class A valve amplifier. 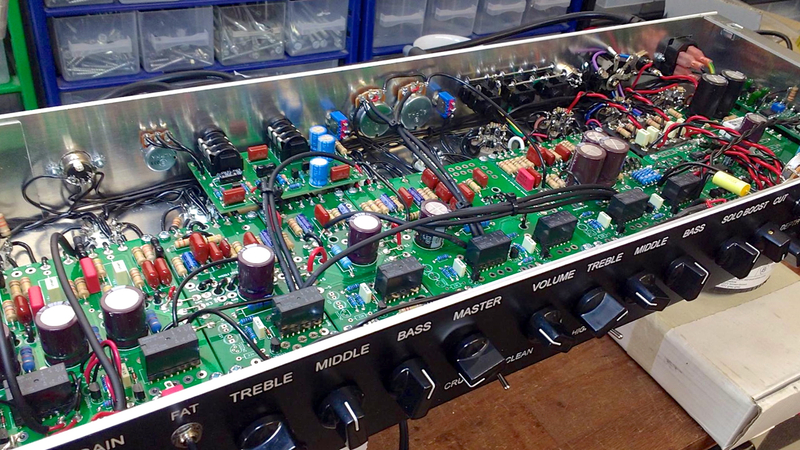 The preamp uses a pair of 12AX7 tubes, while the power amp is fuelled by two 6V6GTs. The amp’s spring reverb unit comes from Accutronics. 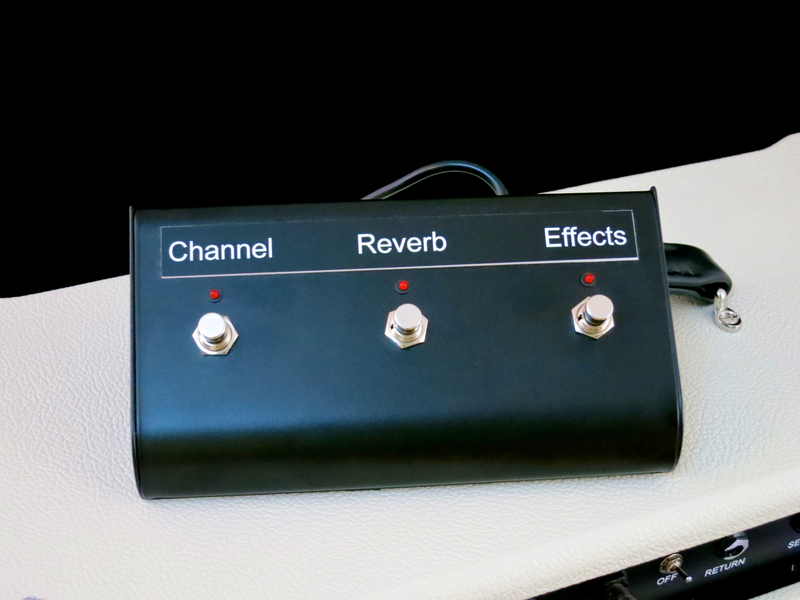 An on/off-footswitch for the reverb effect comes with the combo. 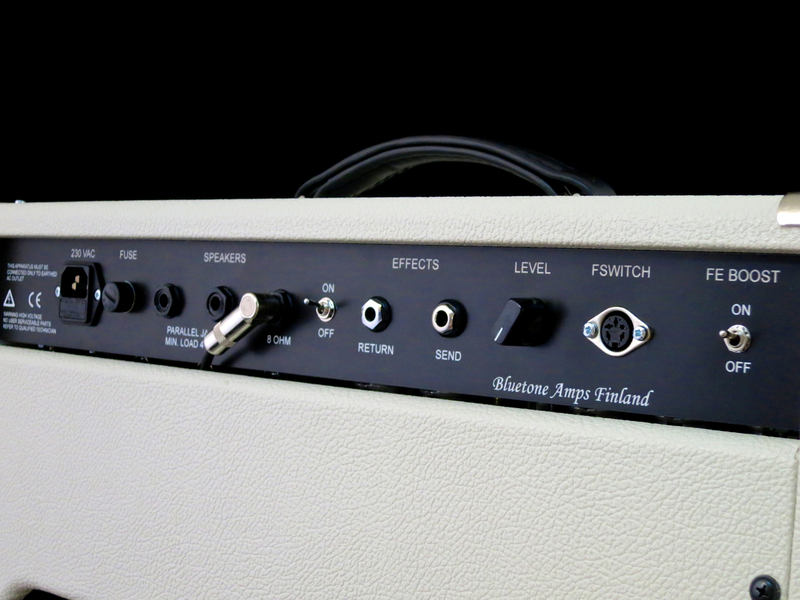 The amp chassis is precision cut (by laser) from solid steel. 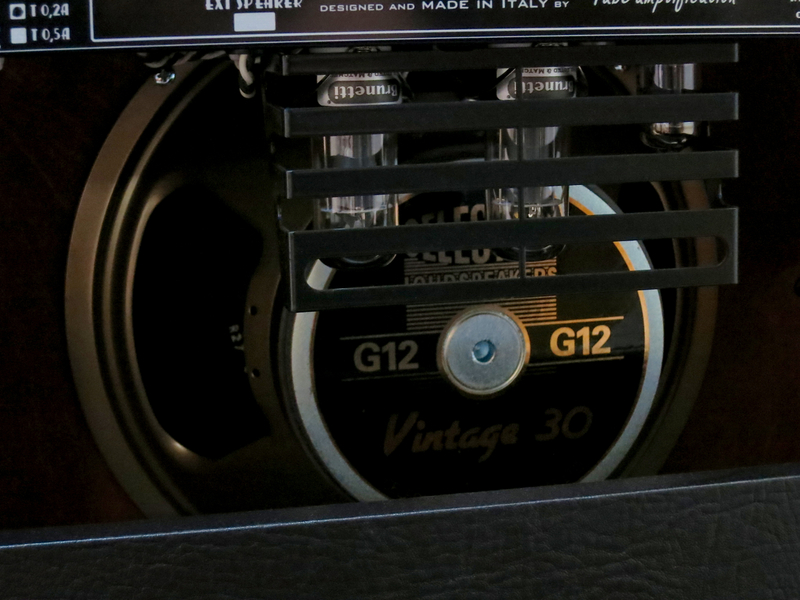 Taking a look inside, we’re greeted by top-drawer components and very crisp workmanship. In contrast to many large-volume manufacturers, Brunetti’s electronics are handwired, and soldered by real people, not robots. 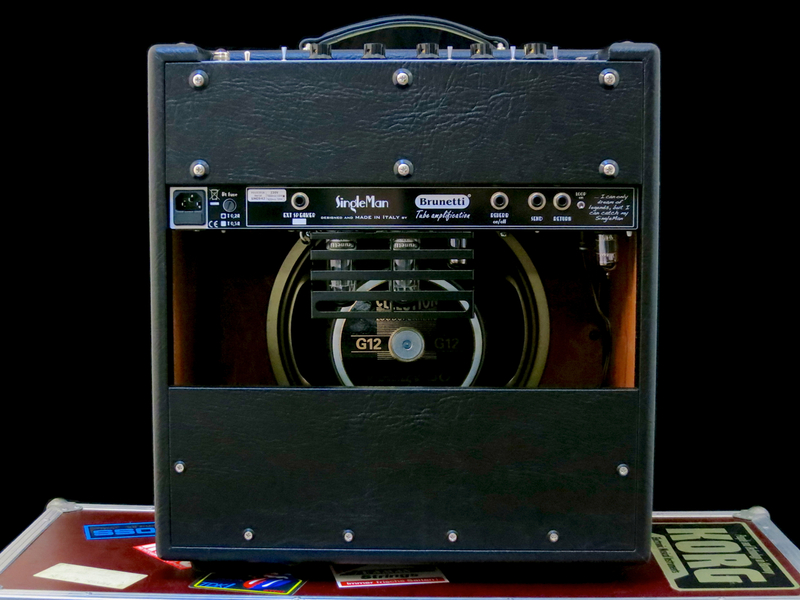 The SingleMan 16’s back panel offers you jacks for external speakers, the reverb footswitch, and an effects loop (with a dedicated on/off-switch). 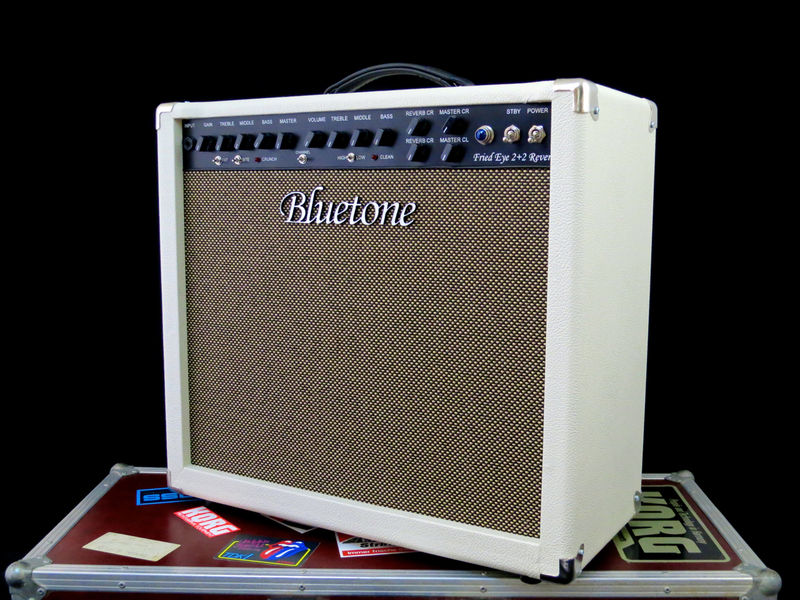 The tonal flexibility of Brunetti’s SingleMan 16 combo mainly comes courtesy of the amp’s six modes. 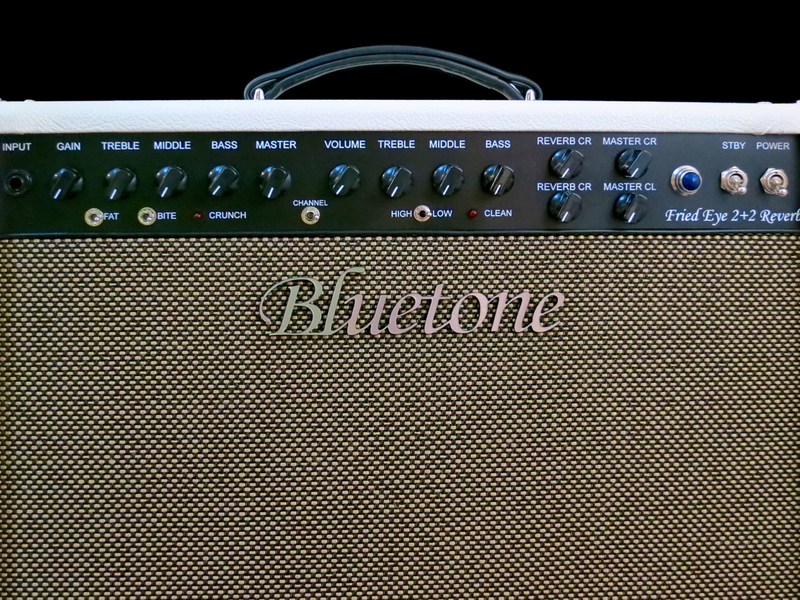 Three modes are provided in the preamp section (by a sturdy mini-toggle), called Tweed, Fat and Smooth. Tweed is the most angular of the three, offering up dry and very dynamic guitar tones. Fat conjures up a warmer, distinctly British palette of sounds. The third mode, Smooth, turns the SingleMan into a bonafide ”cream machine” that’s warm and a bit saggy. Depending on your chosen guitar, Smooth’s richness can be a bit of a mixed blessing. Dark sounding humbuckers might turn into a bit of a mush, here, but spiky single coils will surely benefit from this mode’s innate fatness. 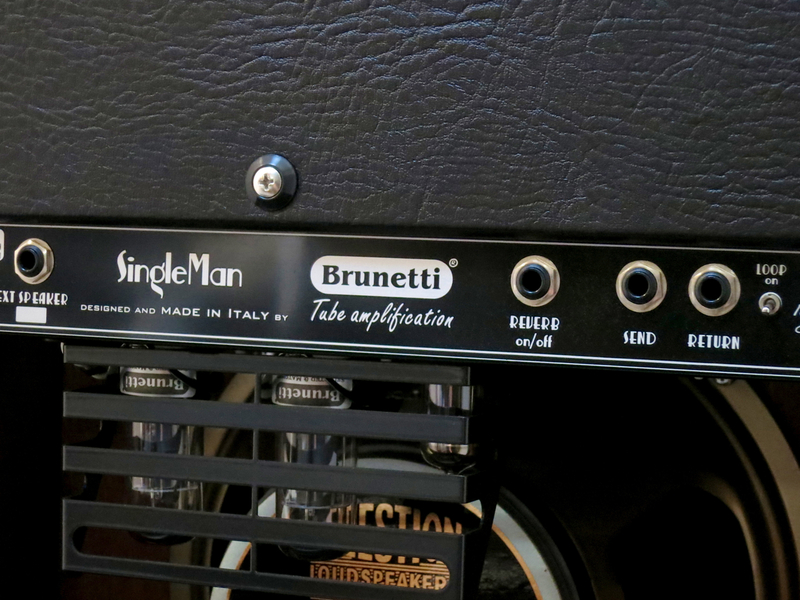 Brunetti’s SingleMan 16 also comes with three power amp modes, which see the power amp running at Full, Moderate (25%) or Quiet (6.25%) levels. Because the output power reduction is achieved by changing the internal voltages in the output valves, switching from one mode to another also has a direct bearing on the combo’s sound and dynamic behaviour. 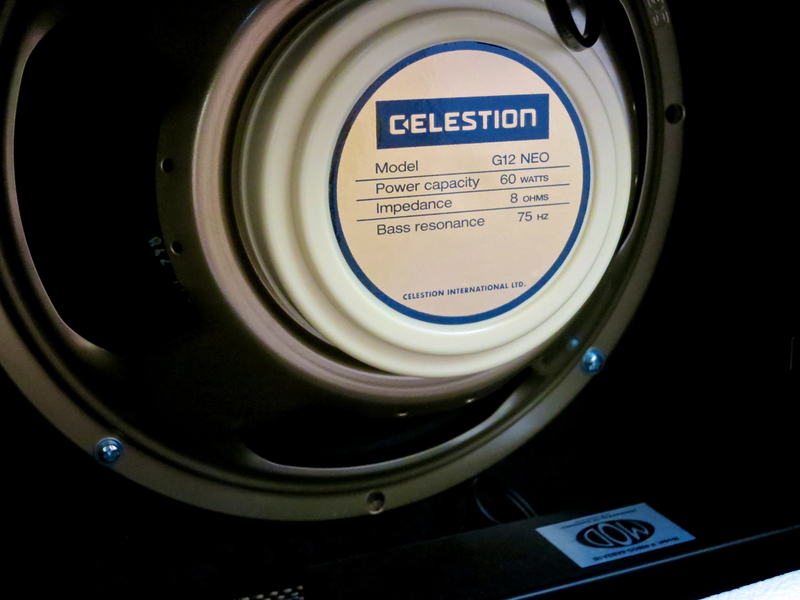 Compared to Full mode, Quiet mode is far fatter-sounding, far more compressed, and seasoned with a good helping of creamy power amp distortion. 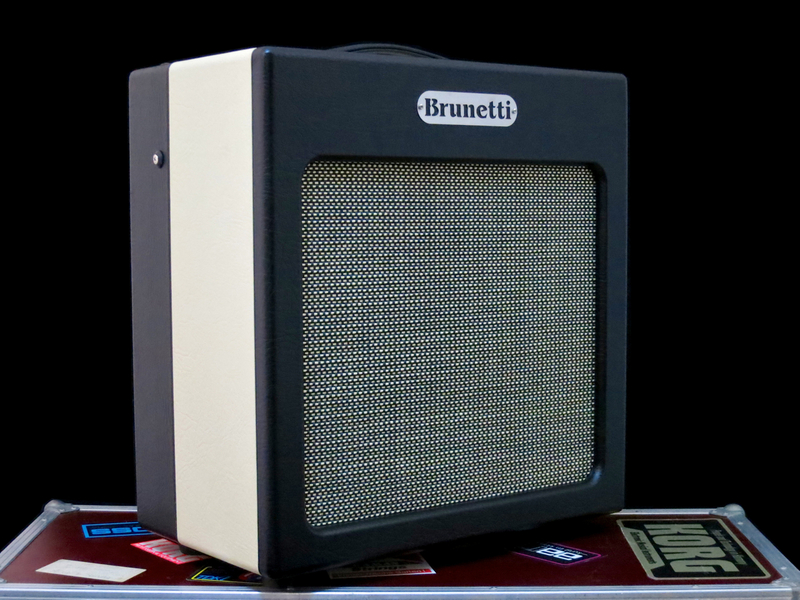 Brunetti’s SingleMan 16 is a fantastic-sounding and surprisingly versatile single-channel tube combo from Italy. It’s practically impossible to dial in a genuinely ”bad” sound, and the combo’s versatility – both tonally, as well as in terms of its output levels – means that the SingleMan 16 will feel equally at home on stage, in the studio, and in your living-room. For extreme clean headroom or bone-crushing amp stack sound pressure, you should probably look elsewhere, but I’m pretty sure most guitarists will find ”their” sound easily using the SingleMan 16. Brunetti Amplification on maineikas vahvistinpaja Pohjois-Italian Modenasta. Marco Brunettin tiimi valmistaa käsityönä laadukkaita ja tyylikkäitä kitaravahvistimia sekä efektipedaaleja. Custom-töiden lisäksi Brunettin valikoimasta löytyy myös useita omia vahvistinmalleja, joista SingleMan 16 on teholtaan pienin kombo. Brunettin tuotteita tuo maahan Pohjanmaalainen yritys NordSound. Perusidea Brunetti SingleMan 16:ta (1.348 €) suunniteltaessa pääasiallinen tavoite oli toteuttaa mahdollisimman monipuolinen ja hyväsoundinen yksikanavainen kombo kätevässä ja kevyessä formaatissa. Kaksivärinen viimeistely ja SingleManin selkeät linjat tekevät kombosta erittäin tyylikkään. Kombo painaa 20 kiloa, ja sen kotelo on tehty laadukkaasta vanerista. Kaiuttimeksi on valittu Celestionin maineikas 12-tuumainen Vintage 30, joka tunnetaan tarkasta ja kolmiulotteisesta soundistaan. Brunetti SingleMan 16 on aito A-luokan täysputkivahvistin. Etuaste pohjautuu kahteen 12AX7-putkeen, ja pääte on rakennettu kahden 6V6GT-putken ympärille. Kombon pohjaan on asennettu laadukas Accutronics-jousikaiku, jonka voi kytkeä päälle tai pois myyntipakettiin sisältyvällä jalkakytkimellä. Vahvistinkotelo on leikattu laserilla ruostamattomasta teräksestä. Kotelon uumenista löytyy kauttaaltaan erittäin laadukkaita komponentteja, ja työnjälki on esimerkillisen siistiä. Toisin kuin monien muiden vahvistinvalmistajien tehtaissa, Brunettin elektroniikka juotetaan käsin, eikä robotin avulla. SingleMan 16 -kombon takapaneelista löytyy liittimet lisäkaiuttimelle, kaikukytkimelle, sekä efektilenkki omalla päälle/pois-minikytkimellä. Brunetti SingleMan 16:n monipuolisen soundin mahdollistavat kombon tarjoamat kuusi toimintamoodia. Etuasteen jämäkkä pikkukytkin tarjoaa kolme moodia – Tweed, Fat ja Smooth – joiden toiminta ulottuu pelkkiä EQ-käyriä syvemmälle. Tweed on moodeista kulmikkain ja kuivin, ja se tarjoaa hyvin laajan dynamiikka-alueen. Fat vie SingleManin soundia lämpimämpään suuntaan, joka on luonteeltaan selvästi brittihenkisempi. Smooth-moodi taas tarjoaa erikoisannoksen kermaa ja muhkeutta. Riippuu käytetystä kitaramallista, onko Smoothin kermaisuudesta hyötyä vai meneekö se jopa liian pitkälle. Yksikelaisilla mikrofoneilla Smooth kuulostaa taivaalliselta, mutta paksunsoundisella kaulahumbuckerilla soundi voi muuttua hieman puuroiseksi. Brunetti SingleMan 16 -kombon päätteellä on kolme eri tehomoodia. Tarjolla on Full, Moderate (25%) ja Quiet (6,25%). Koska tehon rajoitus on toteutettu laskemalla kombon pääteputkien sisäisiä sähköjännitteitä, muuttuu moodivaihdon seurauksena myös SingleManin dynamiikka ja soundi. Quiet-moodissa soundi on Full-moodiin verrattuna selvästi paksumpi, runsaalla kompressiolla ja kermaisella säröllä höystettynä. Italialainen Brunetti SingleMan 16 on erittäin maukas ja monipuolinen tapaus yksikanavaiseksi komboksi. Se kattaa yllättävän laajan skaalan erialisia laatusoundeja, ja päätteen toimintamoodien ansiosta kombo sopii käytettäväksi kaikkialla, olohuoneesta studion kautta klubilavoille. Jos on suuritehoista stäkkiä vailla tai tarvitsee vahvistimeltaan ehdottomasti paljon puhdasta headroomia, SingleMan 16 ei ehkä ole paras vaihtoehto, mutta muille sillä on kosolti annettavaa. 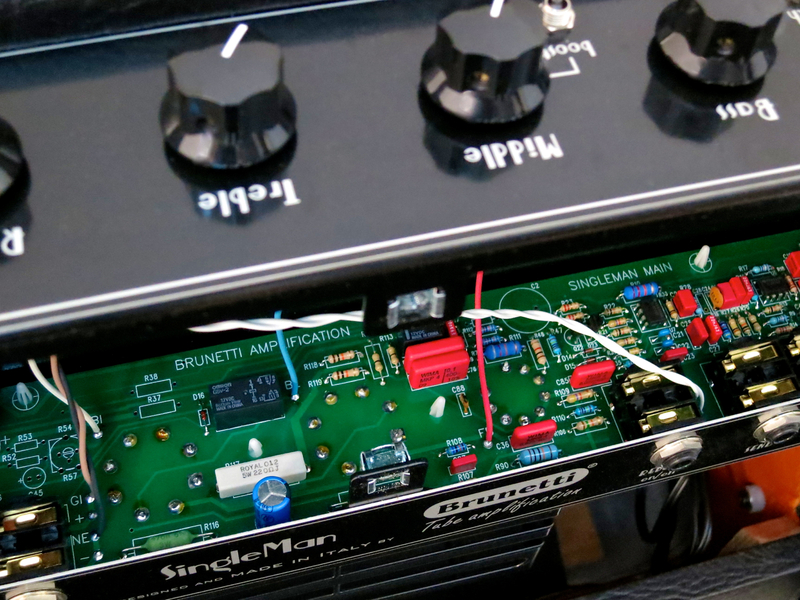 These clips give you an idea of the behaviour of the SingleMan 16’s preamp and power amp modes.